Network Marketing or MLM business is a ray of hope for millions around the world. It brings money, fame, success, freedom and what not! These things are the fruitful benefits of the network marketing business, which not every other stream of business offers. For the majority, Network Marketing Business is a well-defined model with some time and MLM software, it can create quick and surprising lifestyle changes. And still, why do so many people still fail in this business? Well, that’s what will be discussed through the below given 5 network marketing lies. But before all that, let us talk a little bit about the dropouts happening in the MLM field. It’s sometimes referred to as attrition in the contexts of MLM business. In such a situation, the new persons joining the company fallout soon, which may be from a span of a few days to one year. You may be now thinking about what is the role of these network marketing lies in attrition. Yes, they do have a major role because many people recruit new business executives using these lies. These false statements will be the main trigger for the higher attrition rates. and be successful in the MLM career. The first point to discuss is false income expectations. You may have heard about people telling that “they earned $5000 every month”, or “I reached the top position within 3 months and earns $10000 every month”. It all might be true, but the thing that you need to understand, it’s not the same case for everyone. The situations differ for different people and such statements made by the people you know will only develop an unrealistic image in your mind about the income and the time frame required to achieve it. The best approach is to convey a low figure in the beginning. Tell something like, ” I will show you a better plan which will allow you to make $500 per month if you are working part-time. And after that, we will be working together so that you can earn up to $1000 per month!”. There is a big difference in conveying the facts in two different ways. the second one is better and best because it creates a source of trust and of course it’s achievable. Also, the thing that makes it more attractive is that it tells them their income can be doubled through this business opportunity if you do really work hard. So always be careful of communicating in the above-said format. Another big lie followed by the MLM companies or executives is the overhype they create about their products or services. It’s a fact that almost all the companies provide products of good quality. But never give false promises to the customers. Only give actual expectations and never create overhype about the products. For example, if you sell a weight loss product, tell them to give it a try. And let the customer or the executive feel the experience themselves. And if the customer finds the product useful, then they would automatically, come back in search of the product. This is the exact way network marketing is supposed to be. So be careful while talking about your products. It’s okay to have pride in the products you sell. But don’t give an overhype. Just be careful about what you say. Also, try to create some curiosity about the products you sell. Ask questions like, “Why don’t you try using the products and experience the difference yourself?” This subtle approach creates a sense of trust and belief in you as well as your product. This is another big lie which kills your network marketing business. Try to introduce your business opportunity to your prospective clients in a more attractive manner. Tell them it would be really a wonderful opportunity if you are ready to work hard. It would definitely change their entire lifestyle. Or in other words, always try to give your prospect a long term stance, so that it reduces the possibilities of attrition. Never tell such a lie to prospective business clients, because if you are looking for someone really serious to get involved in your business, tell them the exact realities of the business. The true expenses involved in this type of business does not only involve product consumption. It includes other things like having business cards, study materials, websites, leads etc. One of the major drawbacks of quoting the monthly expenditure is that you place then prospect only as a consumer, other than considering him as a premium business builder. Both customers and business builders are valuable, but the latter ones result in developing rapid wealth. If you are looking for business builders, then also try to demonstrate the tax benefits associated with running a home-based business. A lot of people are will be very much attracted by making them understand the benefits of tax reduction. The outline is that make them aware that there will be some expenses if you want to conduct a profitable part-time business from home. This is another network marketing lie which kills your business. Not everyone is your cup of tea. Some may find your business opportunity really worth. And some doesn’t. It’s the case with every business. So never tell or believe in such lies or pass it your downline members. It’s always the best to introduce your business opportunity in a really interesting way so that if the prospect finds it good, they would definitely join. And if not they would reject it. Never force or compel your prospect to join. Let them if they like it. Also ask them for referrals who might be interested in such opportunities, so that from their referrals you may get some better and energetic clients who are ready to work hard other than just join and stay idle. 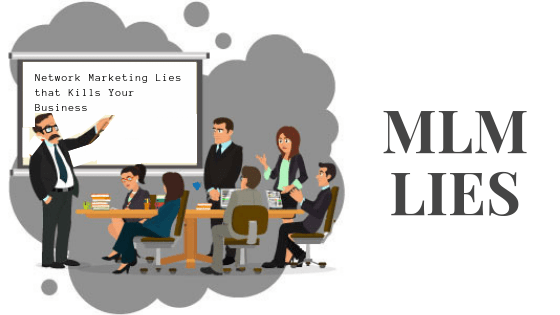 On a concluding note, the above mentioned five network marketing lies are the ones that will definitely kill the credibility of your business. The major deciding factor in building a flock of strong business builders is to tell them the genuine things and help them to view the benefits they will have in the future. It may lead to a small dip in the number of people you recruit, but the quality and retention of your team will definitely increase beyond your imaginations. The power of truth is so high that it can set you financially free. If you are ready to work hard and do the simple but necessary tips to promote products through MLM business you can achieve success in your business. Before starting an MLM business try a Free MLM Software Demo to understand how the Software works for your business.